Giving up pasta when going raw can be a tough battle, but there are some good alternatives, like raw zucchini pasta, or butternut squash, or even pumpkin. Veggies in general can be transformed into noodles or pasta with the proper equipment. Fresh tomato, avocado, nuts, seeds, herbs, garlic, onion, and other spices are usually added to produce a delicious pasta dish just as tasty(and much healthier) than a regular pasta dish. Even fruits such as mangos and pears can be thrown in to sweeten the flavour. 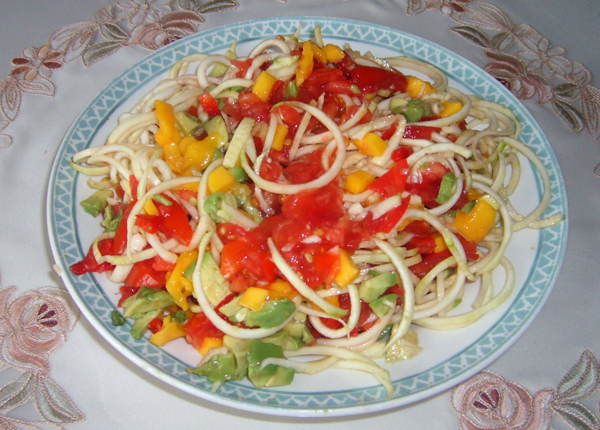 Zucchini pasta is of course the most popular raw vegan pasta out there and this author eats it almost every other day. In the beginning I would hand peel and cut two zucchinis into fine strips but this took time and the angular shape wasn't too appealing, but that all changed when I got my spiralizer. This wonderful tool produces spaghetti-like noodles by pushing the fruit or vegetable(zucchinis are actually a fruit because they contain seeds) through some interchangeable blades. 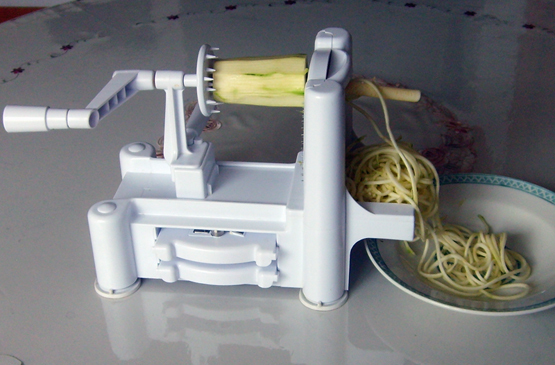 Below is a picture of a spiralizer. They can be bought at anywhere from 15 to 30 dollars in most big grocery or hardware stores. Also available(and cheaper) are smaller handheld devices that can grate or slice your fruits and veggies, but they will not always produce round or uniformly shaped noodles. The spiralizer comes with three different blades for three different slicing results and is easily operable and washable. The blades are very sharp, however, so be careful when cleaning them(I've cut myself a few times). They can cut harder vegetables like potatoes or beets or carrots but do not do so well with really soft or very thin products. The key to a good raw pasta is the seasoning or paste since the zucchini or squash may be rather bland and basically serves as a filler. This is where you can really get creative and the variations are endless. Most like to add tomatoes and onions and parsely, and ground up nuts or cashews(in a blender) can give it a cheesy flavour. Garlic and peppers(usually chopped) are favorites for really spicing things up, and mangos, papayas, and other fruit can sweeten the taste. Some add olive oil or apple cider vinegar, or berries and seeds, or even some raw or lightly steamed/hydrated broccoli or cauliflower -your imagination is the limit. As a strict raw vegan, I stay away from meat, dairy, grain, white sugar and salt, and all processed foods, including most oils. I also try to get as much organic produce as I can even though this may be difficult or expensive. All you really need to stay healthy are fresh natural unadulterated fruits and vegetables(and some nuts or seeds) of which there are so many varieties. It may take awhile for your taste buds to awaken to raw food, but you will be glad you did, as this is the true diet our Creator meant for us to be in optimal health. Vegan(no meat or dairy) is good but raw vegan(no meat or dairy or cooked or processed) is better. All the enzymes and water content are there so your body doesn't have to overwork to digest or assimilate. 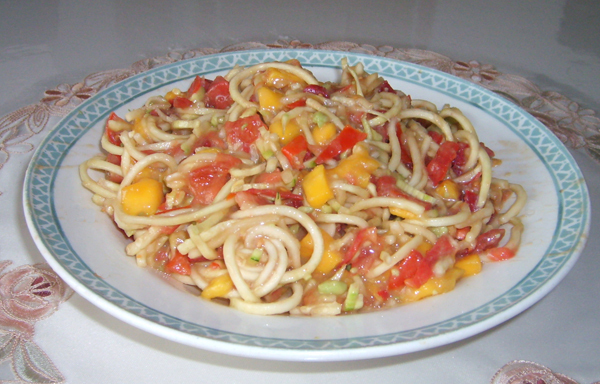 Most cooked foods can be replicated to a great extent with the right tools and the proper ingredients, and veggie noodles are a great example of this. Who says raw foods are boring or tasteless.? Quite the opposite. It's just that we have been spoiled and our senses perverted, always seeking greater and greater taste or stimulation, and more chemicals are added, and this is exactly what is destroying us. When you can eat an apple or pear or other fruit or vegetable directly from a tree or plant without moddifying it in any way -then you are perfect.